Reflected Light? Let’s Not Go There. 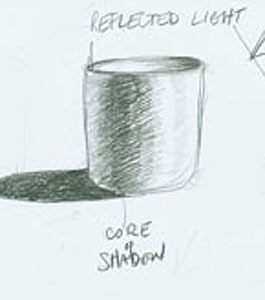 The drawing of the cylinder in the class demo was about 2” high. Everybody stood around and watched how I did it and listened to the straight-forward explanation of how this works. It took 2-3 minutes. So quick, so easy. Students love the effect created by the Reflected Light. They understand how the effect is created. 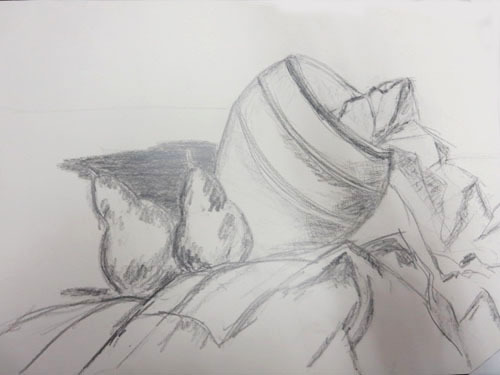 Then they set out to draw a still life that’s full of curved shapes that clearly invite practicing the shading illusion that involves reflected light—bowls, pears, drapery—and, look, they don’t bother with reflected light. Something else happens in their drawings. Why is that? I don’t know, but it’s fascinating to me. And the drawings they produce are fascinating. These are all interesting drawings and so MODERN! The markmaking in one reminds me of Cézanne. 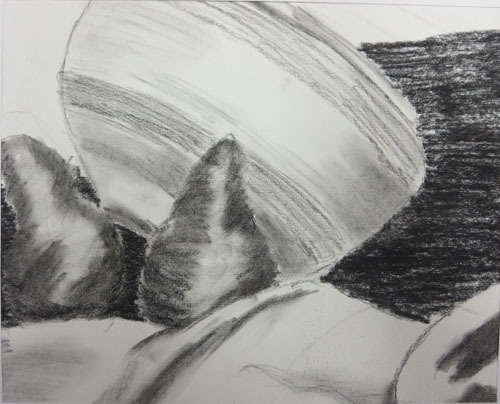 Another student draws as loosely as Matisse. 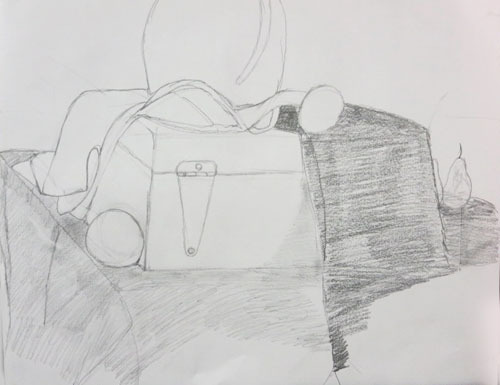 The drawing with the suitcase hinge, playing on the opposition between line and surface, looks like a modern graphic. Reflected Light trick, but she chooses not to. 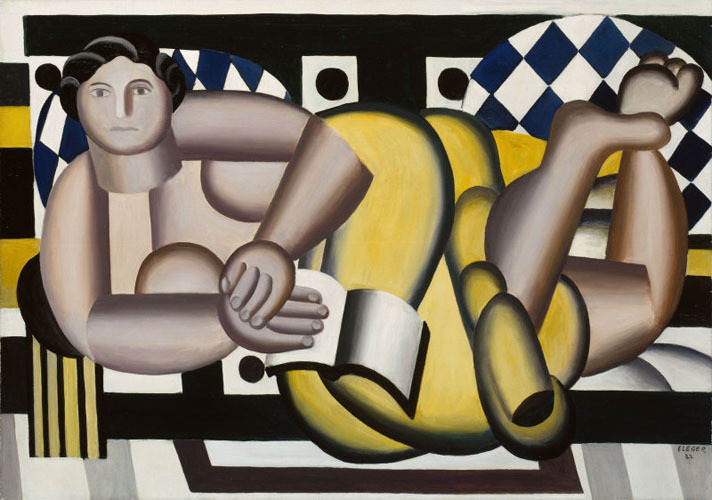 She skips the hard won technique that reigned supreme for four-hundred years in Western Art and plunks herself down in the art-deco 1920’s, right next to Leger. And behold, the pears look like pears and the bowl curves as you expect it to curve. 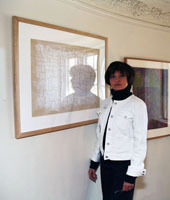 In a few weeks I’ll do the Reflected Light demo again. There will be oohs and aahs and eye-rolling admiration for Caravaggio. And then what? 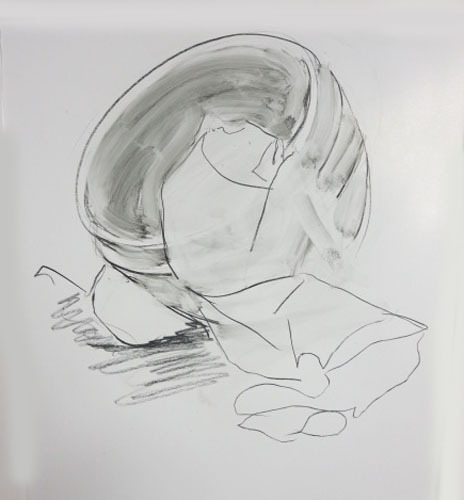 I won’t be surprised when I stroll through the classroom-studio and see drawings that honor Cézanne, Matisse and Leger. Dyed in the wool moderns, all. How did this happen? Don’t know. But it’s fascinating. Exactly what I needed, miss so much your enlightening teaching! Practice. And don’t think of practice as a chore, rather say to yourself that you are treating yourself to an hour of practice today. Two hours would be better, but an hour a day will astonish you.